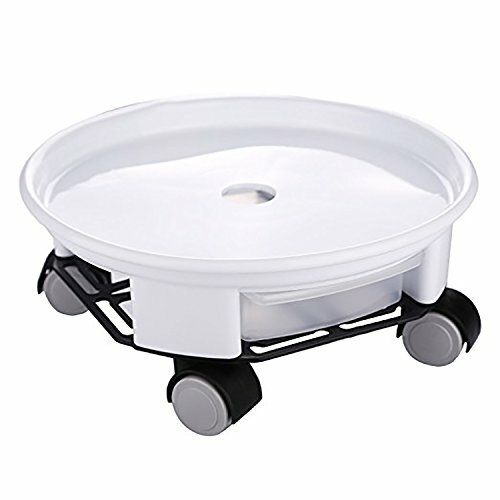 rescozy 14'' Heavy Duty Round Plant Caddy with Wheels and Water Container, White by rescozy at The Net Stores Network. MPN: RC41488. Hurry! Limited time offer. Offer valid only while supplies last. This planter caddy is an easy way to move heavy plants. The bottom has a small drawer to catch overflow of water so it doesn't spill on your floor. This planter caddy is an easy way to move heavy plants. The bottom has a small drawer to catch overflow of water so it doesn't spill on your floor. Protect your delicate wood floor or carpet from water marks, discoloration, and damage with this rolling plant caddy. Provides plants with optimal lighting throughout the day by wheeling them into/out of the sunlight, suitable for indoor and outdoor use. Easily move your potted plants and change your garden design. The plant caddy is perfect solution for your potted plants. Designed with swivel casters and rubber wheels, it allows large plants to be moved safely and with ease. It's specially designed casters keep planters off the floor and makes it easy to move around when cleaning. This weather resistant plant caddy will not deteriorate in harsh weather conditions and will last for years to come. It is a must have for any plant lover. Warm Tips: Generally, inner diameter of flowerpots should be less than that of the plant caddy ( about 1-3cm ). We always supply different universal sizes,welcome to scan more in store. If you have any questions about our products, please contact us. If you have any questions about this product by rescozy, contact us by completing and submitting the form below. If you are looking for a specif part number, please include it with your message. Tierra Garden 40-710 Metal Plant Caddy with Hammered Bronze Casters, 21"